The Armenian paradise of Tavush region is rich in both natural and historical monuments. 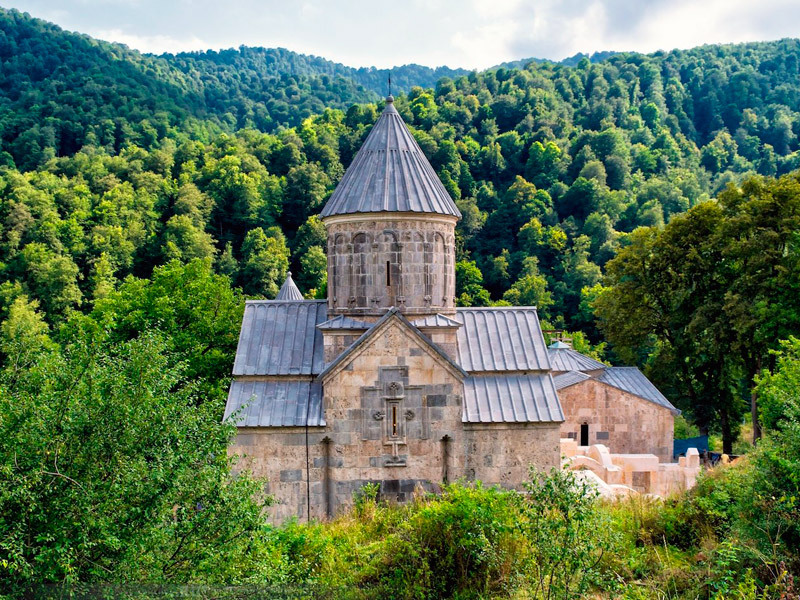 The monastery complex of Haghartsin, one of the wonders of Armenian medieval architecture, is located 18 km to the north of the resort town of Dilijan. The exact date of construction of the monastery is unknown. According to historians, the monastery was gradually built from the 10th to 13th centuries. Due to numerous enemy raids, as well as earthquakes, monastic structures and churches were repeatedly destroyed and restored. It is only known that Haghartsin Monastery had been flourishing from the 12th to the 13th centuries. It was at this time that the monastery in various historical sources was mentioned as one of the most important and leading scientific and cultural centers of Medieval Armenia. 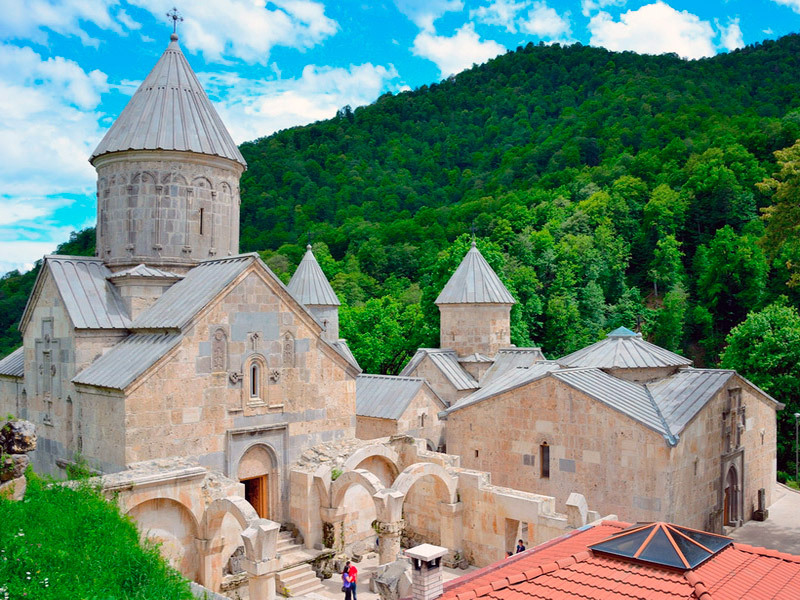 The monastery complex of Haghartsin represents an amazing harmony of architecture and nature. Haghartsin, like many Armenian monasteries built between the 7th and 13th centuries, belongs to the group of dome-shaped which is called “katoghike” in Armenian. Typically, church dome is supported by four columns that dominate the ensemble and are considered its central structure. Very often monastery ensembles include several churches and chapels, and Haghartsin is no exception. Haghartsin complex includes three churches: the Church of the Holy Mother of God, St. Gregory and St. Stephan’s. The oldest of them, the church of St. Gregory, was built in the 10th century. Under the Church of the Holy Mother of God there is an underground vault that has no way out: it is a church treasury where monks kept sacred relics from strangers. Haghartsin monastery complex also has an underground passage that leads to the river. It was built as an escape route during earthquakes and wars. 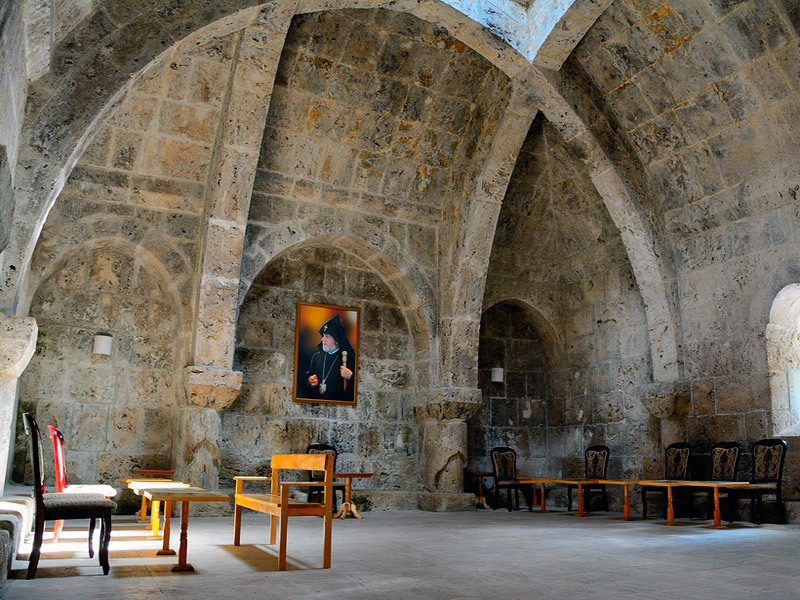 Haghartsin complex also includes a chapel, a dining hall, a bell tower, a library, monk’s cells and originally Armenian khachkars. About 300 monks used to live in the monastery. In addition to churches, special attention should be paid to the refectory hall. This building is an outstanding example of medieval Armenian architecture. Every detail is clearly thought out from a mathematical and economic point of view. For example, on the top of the building, there are two domes, resembling dormers, which let in the sun’s rays and illuminate the refectory hall. The building of the refectory stands on 12 columns, which symbolize the 12 Disciples of Christ. This once again proves that the monastery served not only as a religious center but also as a scientific center, while the monks who lived at that time possessed the valuable knowledge, taught and enlightened the people. Another proof of this fact is the sundial, which was widespread in medieval monasteries. With their help, monks could calculate the exact time of the day, including the time of worship. Not far from the Haghartsin monastery complex there are unique cell-chapels with a strict altar inside. They were inhabited by hermit monks who held worship services without having to leave their cells and contacting with the outside world.